We strive to provide courtesy and promptness with each and every delivery. Click here to read what our customers have to say. This is Tom Hendershot at Antiquities Company in Rockford. In the past few weeks, several of you have helped me with the safe delivery of some dinosaur items for a museum exhibit I’m building. First, I’d like to say ‘thank you’ for getting everything done so efficiently and safely. You’re really a great group to work with; I’d give you my highest recommendation. Secondly, I told a couple of your team members I’d send a photo of what was in the dinosaur crate and boxes you received and delivered to me. So, attached are a couple of pics for you. One is a life-size Deinonychus raptor that in the movie ‘Jurassic Park’ was called ‘Velociraptor’. (A true Velociraptor was smaller, but Deinonychus was a real Jurassic raptor.) 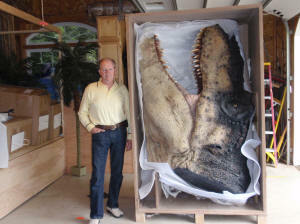 The other photo is of a life size T. Rex head in the crate you delivered. The head represents a T. Rex that would have been about 45 feet long and weighed about 5 tons. Hope you find the pics interesting…thanks again for your excellent work!